20 Amp, 5 Core, 3 Phase Light Industrial Extension Leads. The “light” extension lead is suitable for infrequent short duration indoor use. The “light” extension lead has the shortest maximum length allowed from the outlet to the appliance. 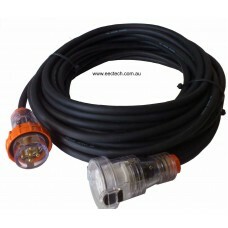 20A 5 Pin 3 Phase Australian Standard Light Duty Extension Lead Length: 5 m ..
20A 5 Pin 3 Phase Australian Standard Light Duty Extension Lead Length: 10 m ..
20A 5 Pin 3 Phase Australian Standard Light Duty Extension Lead Length: 15 m ..
20A 5 Pin 3 Phase Australian Standard Light Duty Extension Lead Length: 20 m ..
20A 5 Pin 3 Phase Australian Standard Light Duty Extension Lead Length: 25 m ..
20A 5 Pin 3 Phase Australian Standard Light Duty Extension Lead Length: 30 m ..